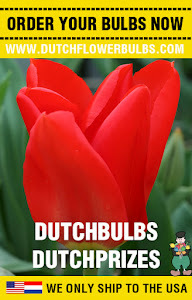 Dutch Flower Bulbs: Planting Bulbs; a few handy bulb planting tips! Planting Bulbs; a few handy bulb planting tips! There is a trick to determine how deep you have to plant bulbs: plant a bulb 2,5 times as deep as the bulb itself high is. BUT; on every rule there is an exception! 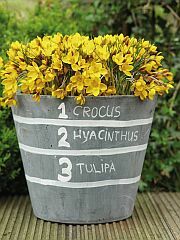 Frittilaria, Colchicum and Lilies need to be planted a little deeper, as Begonia, Iris and Cyclamen like to be just under the surface area. Not every bulb has the same shape, some are hollow and it is sometimes difficult to see in which direction you have to plant the bulb. 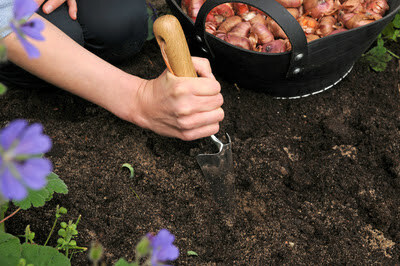 - 'pointed' bulbs should be planted with the tip up (narcissus, tulips, lilies, hyacinths, gladiolus and crocus). - begonia's and cyclamen should be planted with the hollow side up. - plant dahlia's with the rest of the dry stem from previous year, to the surface. When you are in doubt, plant the bulbs on their side, so the stem will always find his way to the sun. If you want flower bulbs between other plants (shrubs, perennials) or in your border, then you plant them each separately. Use for the smallest bulbs a dibble. For the bigger ones (dahlia's and lilies) you dig a hole with a planting shovel, large enough to spread the root tubers for example of a dahlia.